Especially if you aren’t used to working with lighting, it’s easy to default to traditional methods of changing the look of your stage. Don’t get me wrong; sometimes building a set, repainting walls, or working with huge yardages of fabric can be exactly the thing, and the result can look really cool. On the other hand, that can also cost a lot of money, require lots of shopping trips, and consume massive amounts of staff time & volunteer time. One of the best things about lighting is that it allows for major look changes at a fraction of the time and cost. 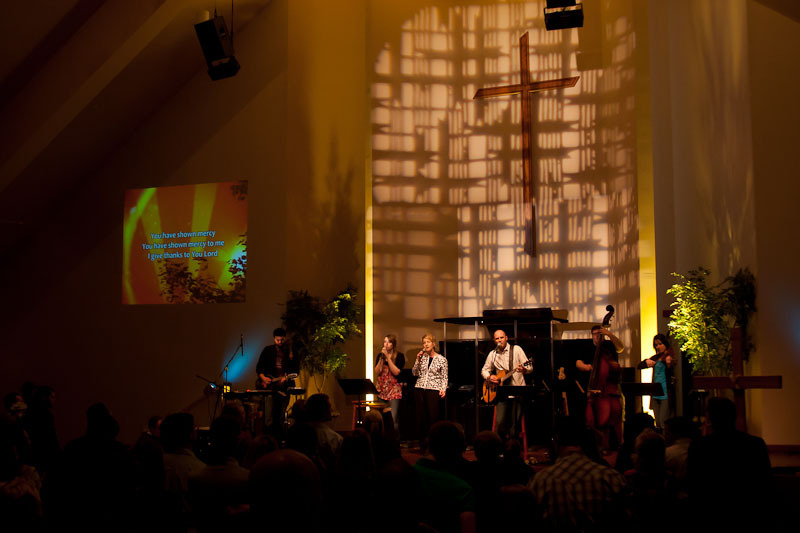 One of our lighting problems has been the cream-colored chancel wall that backs our stage. It’s roughly the same color as human skin, so when we tried to light up people’s faces with the par cars far above the stage, the light spill on the wall would work against us, making everyone’s faces blend in to a cream-colored mess. For us, the nontraditional answer was to light the chancel differently. 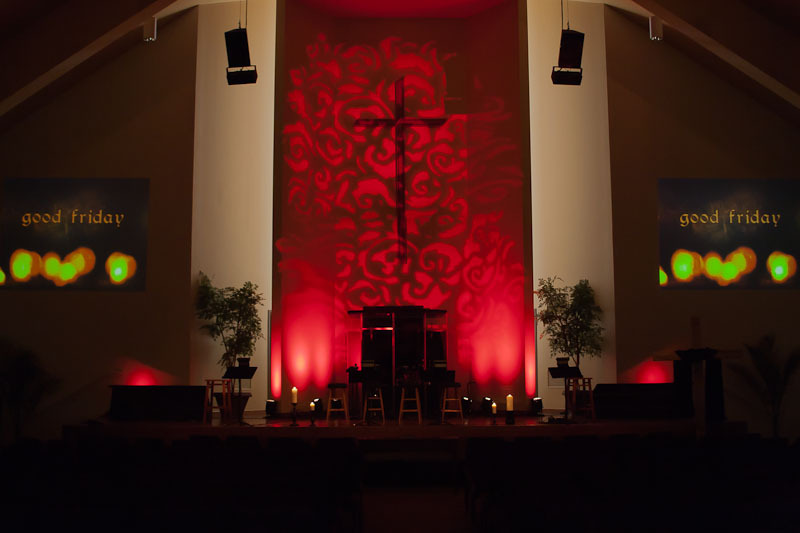 The patterns on the back wall in the pictures above (and in the previous post about Easter) were made by putting easily-changeable gobos (metal disc patterns) in two ellipsoidal lights mounted on our back wall. The colors you see in the pics are readily available gels inserted in frames mounted to the lights. Especially if you buy used equipment, it’s not particularly expensive or difficult to get looks like the ones above. If you want to give it a shot at your church, I’ll be glad to try to answer any questions you have about equipment, sources, etc. Posted on May 31, 2011 at 3:55 PM.